Your child’s first set of baby teeth should have all come in by the age of 3, but you can teach them to brush their teeth much earlier than that. In fact, it’s a good habit to clean your child’s mouth before the teeth even before their first teeth erupt. There are many soft finger brushes you can use to gently scrub away milk build up or food debris on your child’s gums and tongue. Babies are very perceptive and this simple routine is the first of many good dental habits your child will need to maintain strong and healthy teeth. Show them how to grip the toothbrush correctly. The toothbrush may seem like a toy to them, so you need to show them to use and care for it properly. Demonstrate how to brush and have them practice without toothpaste. Have them practice the motions on a doll! Give your child a pea-sized amount of toothpaste. Kids can have trouble not swallowing foam or toothpaste, so you don’t want to use too much. Toothpaste can be toxic when ingested in excess. Brush your teeth with your child! Make brushing time family time. It’s also a good way to check if they’re brushing thoroughly, even in hard-to-reach areas. You can set a timer for two minutes or watch a fun video during this time to make sure your child is brushing long enough. Rinse. Keep a cup nearby, so your child can quickly and easily rinse their mouth after they brush their teeth. And of course, don’t forget to floss afterward! Flossing can be hard for kids, so you may want to get them dental flossers or kid’s floss for your little ones. Make sure they get well under both sides of the gums to remove all the food debris and plaque. Once your child is all done, ask them to flash you their pearly whites! Give them encouragement and praise for a job well done. Establish an oral hygiene schedule. 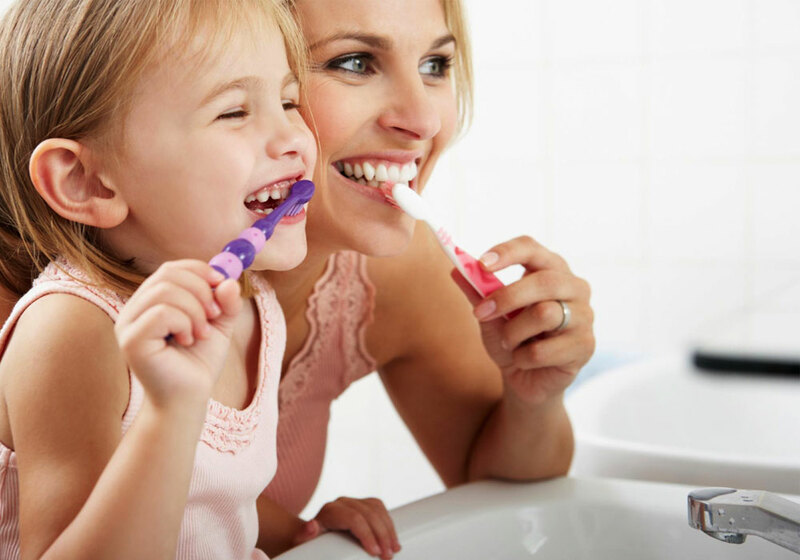 Time is relative and your child will remember to brush their teeth in relation to other specific activities right before or after they brush. For example, you can let them watch their favorite show right before they brush their teeth and help them change into pajamas right after. Doing the same things every single day at a specific time will help them remember when to brush. Reward your child after they brush their teeth. Give them a high five or sing a lullaby when they remember to brush their teeth all on their own. Put on a show. Kids love a little drama, so exaggerate how bad their breath smells when they don’t brush their teeth. After they do brush their teeth, tell them how gorgeous and sparkly their teeth look. Tell a story. Children respond better to stories. Read them a story about the importance of oral care or tell them your own personal experience! They’ll probably relate to the character and understand the importance of brushing from that character. Scare them a little. Rotten teeth look pretty scary, whether you’re an adult or a child. Don’t go overboard, but show them pictures of what could happen if they’re not diligent about their dental care. Brushing twice daily and flossing nightly is the best way to prevent unwanted cavities. Having strong healthy baby teeth is important because those teeth hold the space for adult teeth. They also promote bone and bite development. Once your child is 3 or 4 years old, talk to your pediatric dentist about introducing fluoride into your child’s dental routine. Fluoride is a naturally occurring component that is known to remineralize the teeth, making them brighter and stronger. It’s already present in the water that we consume, but it can also be applied topically. Just remember to ask your pediatric dentist what an appropriate amount of fluoride is. While fluoride is great, overconsumption of it can lead to fluorosis, a condition that causes the teeth to have white or brown spots. Habits that are totally fine for babies can be very harmful to toddlers. Drinking from bottles and sucking on pacifiers or thumbs should be reserved for infants. Having an obstruction in the mouth all the time can cause the jaw and teeth to form in an abnormal shape. Having an incorrect bite can lead to unattractive crowding, impacted teeth, or gaps for adult teeth. It can even lead to bruxism and jaw disorders that are painful and expensive to fix. While there are ways to fix these issues (palatal expanders, retainers, early orthodontics, etc), it’s much easier to prevent them! Next time your child asks for the bottle or a pacifier, give them a regular cup or sippy cup to drink from. They’re less likely to sip on that for an extended period of time, which also reduces the risk of cavities. There are also lots of thumb guards or decorative strips you discourage your child from thumb sucking. Toddlers and preschoolers have a lot of growing to do, so they need energy from their food to do it! It can be hard to get kids to eat their fruits and vegetables at a young age, but you can easily disguise those foods when they’re baked in pasta or served with rice. As you probably know, kids also need calcium and vitamin D to develop strong bones and teeth. Children can get their vitamin D from the sun (along with sunscreen), but calcium is mostly derived from the diet. Dairy products like cheese, milk, and yogurt are the usual go-to items that kids like to eat, but they can also get their recommended calcium intake from enriched plant-based products and vegetables as well! One item you want your child to avoid is sugar. Unfortunately, many products that are marketed as healthy are actually full of sugar or fat. Always check the ingredients list before purchasing to ensure you’re getting what you really want. While your child can and should enjoy the occasional treat, supervise their consumption and have them rinse their mouths after. Bacteria feed off of sugar, creating acids that damage the enamel. This is what causes cavities, gum disease, and tooth decay. Yuck! Last but not least, toddlers and preschoolers need to see the pediatric dentist just as often as you see the dentist. A checkup and cleaning every six months will help keep your tot on track to having a stunning smile! At Epic Dentistry for Kids, our pediatric dentist is trained to work with children at every stage of development. Dr. Patterson can provide nutrition counseling, oral care guidance, dental cleaning, and more for young patients. Not only is he great with kids (he has two of his own), his education in pediatric dentistry includes communication and behavior management, so he can definitely handle toddlers with grace. If you’d like to learn more about pediatric dentistry, give us a call and we’d be happy to answer any questions. Previous post:Family Fun in Denver this Spring!